Shaft Diameter: Select 1 5/8" 1 3/4"
Ultra-thin. Ultra-light. Ultra-stiff. Ultra-strong Maybe we should call these Ultra-blades. 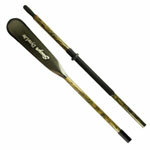 The Sawyer DyneLite blade is the lightest oar blade on the market -2lb overall weight with a 15oz tip weight - and features a very thin cross section and controlled flex. 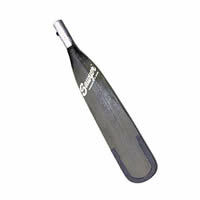 The Sawyer DyneLite blades are manufactured from carbon fiber, Dynel, fiberglass and epoxy over a wood core. Available for 1 3/4" or 1 5/8" I.D. shafts. If using on Sawyer Outfitter shafts choose 1 3/4", if using on standard Sawyer, Carlisle or Cataract shafts choose 1 5/8"
From Anonymous of Silverbow , Montana on 12/8/2017 .